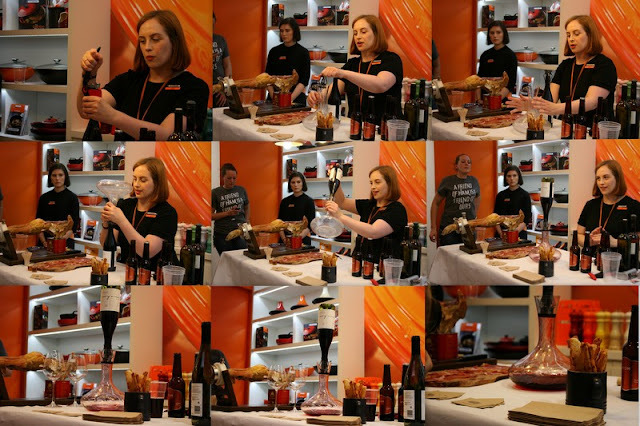 Le Creuset invited me and some fellow bloggers (and D) to view first hand their cheese and wine collection in their Leeds store located in the Victoria Quarter. Le Creuset are lesser known for their wine products but are fast gaining popularity in the culinary world. Following the demonstrations I could definitely see why and it's fair to say I've added a few more items to my wish list. First to demonstrate to us that night were the lovely ladies from Friends of Ham. When we arrived a Serrano ham was being carved up and placed in neat strips on a wooden board. My keen eye was on this from the moment I arrived, I couldn't wait to give it a sample. The Serrano ham was served to us alongside a sherry, the sherry made with palomino grapes is matured in barrels and is generally made in Spain. The free range happy ham brought out the sweetness in the sherry with its savoury and salty taste. Following the ham and sherry tasting was the cheese and beer tasting, if someone had to ask me to choose which I preferred better, ham and sherry or cheese and beer, I'd have a difficult time deciding. The cheese that we sampled was a Dutch Irish Gouda that has been made by the same family for 30 years! Luckily this sample was only 2 years old rather than 30... The cheese was accompanied by a chestnut beer brewed in Hull and is a traditional brown ale style. It quite a hoppy character and the roasted chestnut brought out the tanginess in the cheese. The gals know their stuff. I was also delighted by their enthusiasm and it left me thinking that they probably have the best job in the world. My ambition in life is to own every Le Creuset colour cup and a a kitchen big enough for them all! 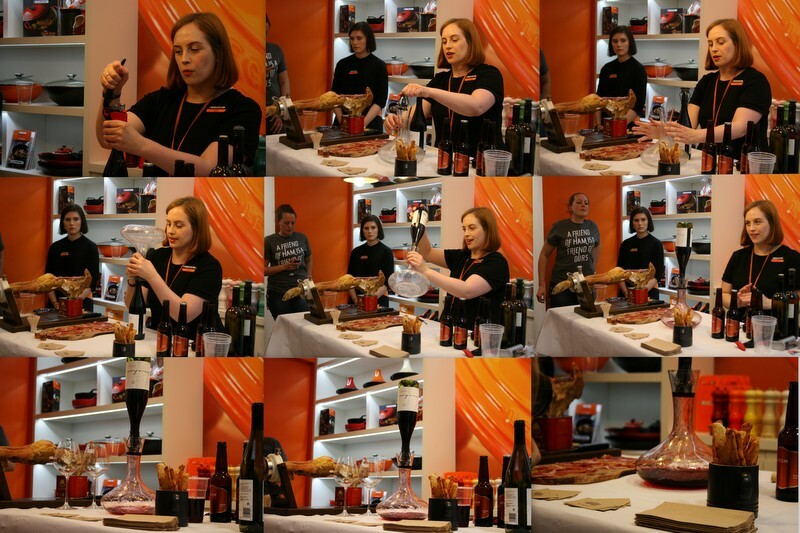 Following the demonstration and tasting from Friends of Ham was the introduction to the cheese collection by Le Creuset. A cheese fondue was presented to us in which we all delighted in dipping in pieces of bread and a few of us tried dipping FoH's ham too! It was much more pleasant than I was expecting as it wasn't solely cheese and therefore less sickly. Le Creuset offer a fondue set that comes complete with long spiky forks for you to really get that 80s feel. Unfortunately as there was a few of us in attendance we didn't get to see it in action as it may have been too small to feed us greedy lot, but you can see it here. Next up was the wine accessory demonstrations. We were shown the various accessories to open the wine, my favourite being the pelican looking implement, it looked so simple and effortless! I could definitely do with one of those. Alongside this there were smart gadgets to remove that nuisance foil in a perfect way and stoppers that pull out the air from the bottle and keep the wine much longer than your average wine stopped. Next up was more cheese! We were presented with a baked Camembert in a special Le Creuset Camembert baker (I also need one of these in my life - take note family for Christmas gift ideas). Once again these were no simple and regular samples, Le Creuset presented us with something a little different. First to be brought out of the oven was a sweet and salty Camembert, a Camembert baked with diced pancetta and then sprinkled with pomegranate seeds. What a genius idea! I'll definitely be replicating this at home. As if one Camembert wasn't enough we were then offered another to sample, this time a Camembert roasted with glazed figs. The sweetness of the figures really offset the cheese, another one to add to the dinner party checklist. I'd like to thank Le Creuset for inviting me a long, it was great to see some live demonstrations and really show me how great your products are! (Not that I ever doubted you).